Well you may wonder what that has to do with Banana Bread. Well, photographed you can see fresh raspberries in the dessert. 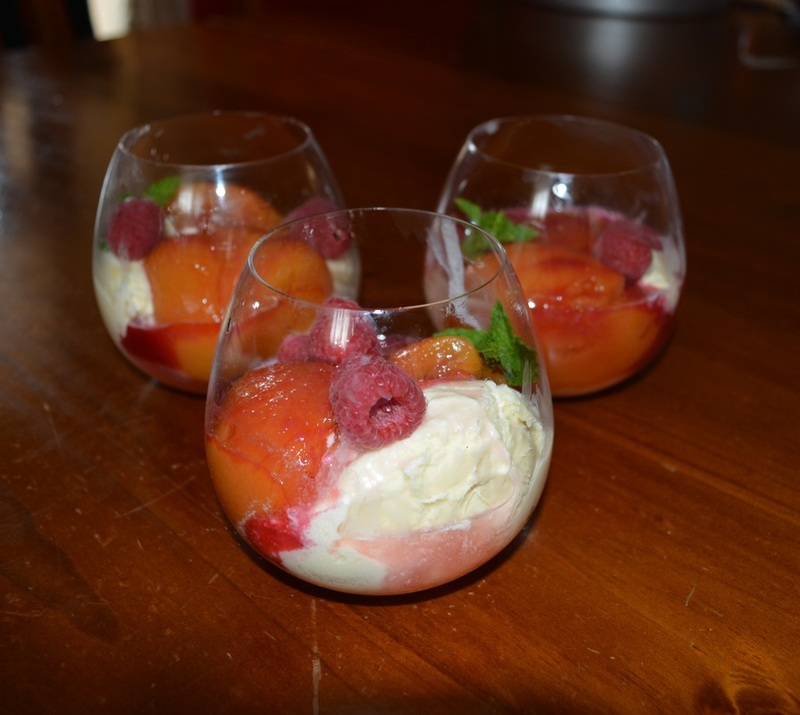 In the dessert I made the previous night, I forgot to add them to my Peach Melba. So now I had raspberries in the fridge that we needed to eat. 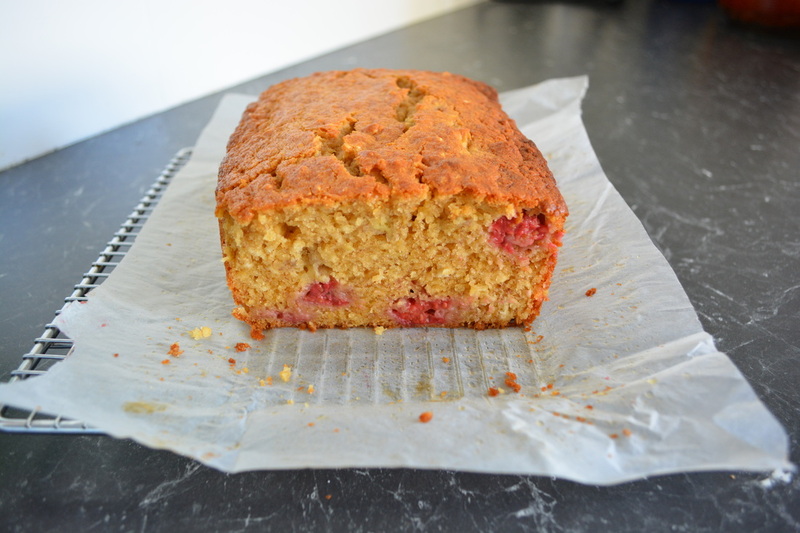 Now my kids love fresh raspberries and they could have just had them like that, however, I also had two old bananas that needed to be used up, so that is why I made this Banana and Raspberry Bread. It was delicious. It was moist, tasty and so easy to make. My kids absolutely loved the edition of the raspberries, I have never seen my 8 year old eat anything slower. So I asked him if he likes it, thinking he may not, seeing he is eating it so slow, his response was I love it so much I want to enjoy every bite. He makes me laugh. You can use frozen raspberries if raspberries are not in season. And with the bananas you need at least 1 cup of mashed banana, I'm ok with having more banana (that is why I say two large bananas), but not less. 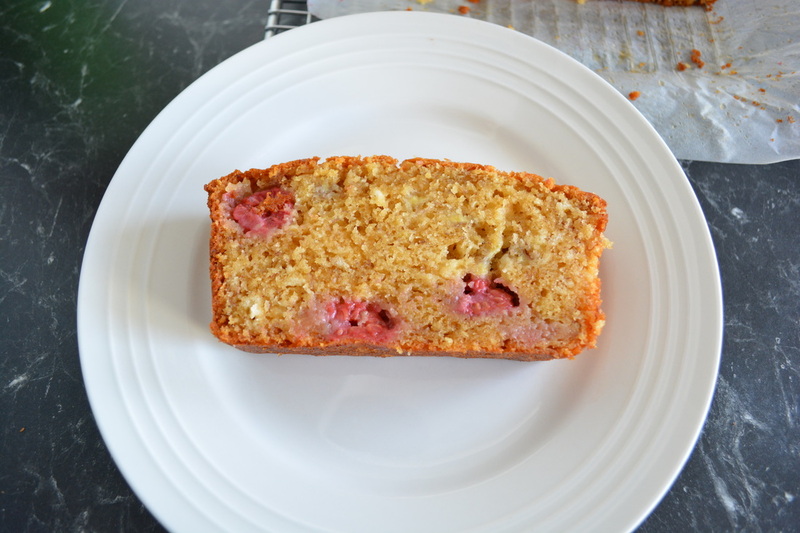 So if you are looking for a simple yet tasty banana bread recipe and you have a few raspberries to spare, try this it is delicious, perfect for breakfast, lunch or as a snack, anytime really. Grease and line with baking paper a 7cm deep, 11.5cm x 21cm (base) loaf pan. Make sure the baking paper overhangs by about 2cm, so you can pull out the banana bread from the loaf tin after it is baked. Using an electric mixer, in a large bowl, beat together the butter and sugar, until pale. This takes about 2-3 minutes. Add eggs, one egg at a time, beating well between each addition. Now using a spoon, mix in the mashed banana. Add the flour, baking powder and milk, stir until the mixture is nearly completely combined. Add the raspberries and fold them in gently until the mixture is completely combined. Spoon the mixture into your prepared tin, place in the preheated oven and bake for 45-50 minutes or until a skewer inserted in the centre comes out clean. Cool for 10 minutes in the tin, before lifting (using baking paper as handles) and placing the banana bread on a cooling rack to cool completely. Slice and serve (with or without butter).